Window film, glass, sunlight, hammocks, hammock stands, pillows. 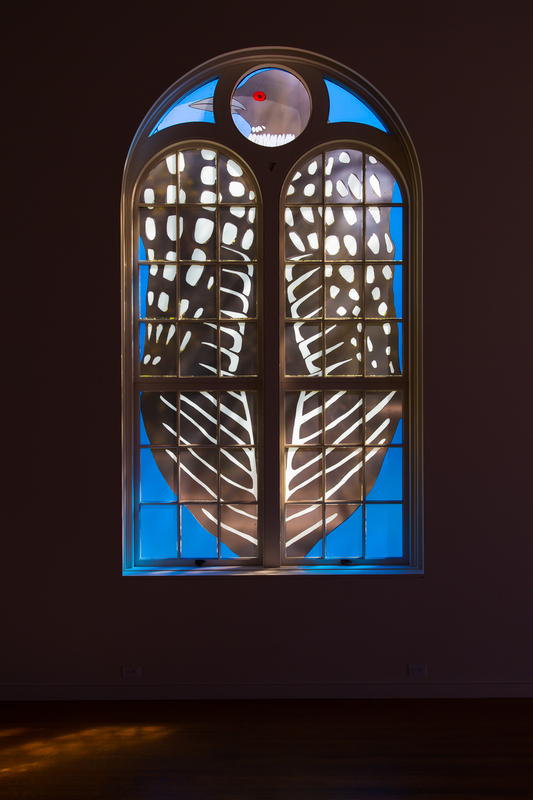 ‘the go-betweens’ installation enhanced a screening of the 2014 film Layover celebrating the arrival of Portland’s annual migratory Vaux’s Swift population. The go-betweens hovered a month in the arched windows of the Art Gym at Marylhurst University, held the edges between inside and out. Visitors lounged on pillows and hammocks to the sounds of Sam Coomes’ original score and vinyl feathers interposed spring sunlight. The birds were made collaboratively by Vanessa Renwick, Jim DeStaebler, Alex Luboff, Dwayne Hedstrom, and George Wilson. They were meticulously cut out by the aforementioned individuals, as well as Eden Reinstein, Erin Brand, Sid Cooper, Moe Bowstern, Tiago DeJerk, Lucy Rockwell, Libby Werbel, James Allen, Natalie Barela, and Eric Edwards. Career Opportunity grants from the Oregon Arts Commission and the Ford Family Foundation provided important funding directly to the artist.